George Hillan felt Gosport & Fareham missed an opportunity in their 33-22 London two south west defeat at Twickenham. The senior coach believes the visitors had enough possession to win the clash, while the home coach admitted Gosport deserved more. Nevertheless, Hillan is delighted with the improvements his troops have made following their heavy loss to rivals Eastleigh two weeks ago. He said: ‘This was a game that got away from us. ‘I couldn’t ask any more of the players because their physicality and the way they played the game was very good. ‘The opposition coach admitted we deserved more and we didn't look like a team that had lost by 50 points two weeks ago. ‘This shows how far the players have progressed from a dark moment in our season. ‘We just need to convert the opportunities we create and turn possession into points. Gosport trailed 19-15 at half-time following tries from Tom Lewis and Sean Shepherd. In the second period the visitors’ only score came from a Sean Taylor try, converted by Dom Holling. Meanwhile, in London three south west, Petersfield's 65-7 defeat at Old Georgians was marred by a serious ankle injury to centre Ben Wakefield. The game had to be moved to a different pitch in the first half while the youngster waited for an ambulance. The visitors’ only score came before the break when Ryan Morse powered past three defenders. Scrum-half Josh Haslett added the extra points for Petersfield. 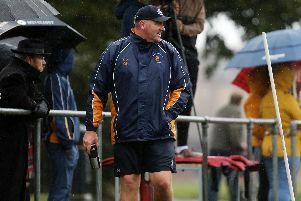 Senior coach James Alder wants more from his winless side going forward. ‘We need to show greater commitment, work hard and show desire,’ he said. ‘Once again we went into the game without key players. 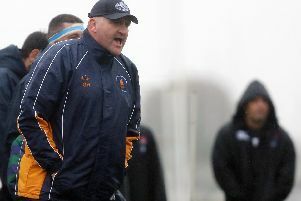 ‘We had to move players around and Old Georgians exploited our weaknesses. ‘On a positive note we put together some good phases for our try. ‘In the second period we set up some good attacking opportunities only to miss out by making errors. Fareham Heathens had to settle for a bonus point in their 22-17 loss at Alresford in Hampshire premier. Dave Wheaton admitted the Heathens failed to stick to their game plan. The player-coach said: ‘Alresford’s large pack, for the most part, had control and our game plan was to spread the ball quickly and away from their forwards. ‘Frustratingly we seemed to keep going back into the danger area. Locksheath Pumas suffered a 22-19 defeat at Overton in Hampshire one.